Monterey Boats of Williston, Florida is celebrating its 25th Anniversary this year. “Twenty-five years ago, we began with two models and a dream to be one of the best boat manufacturers in the world.” For 2011, Monterey has a total of twenty-two models in four series from 18-feet to its forty-one foot 400 Sport Yacht model. It even created a 328 Super Sport Anniversary Edition model this year to celebrate the occasion. 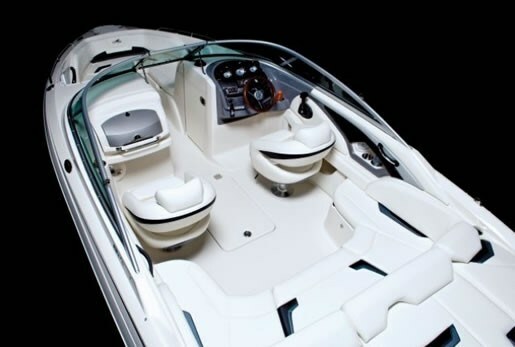 The 224FS Sport Boat, subject of this review, is a new model designation for 2011. The “FS” denotes “Facet Series” which Monterey describes as “their sharp, crisp contours are reminiscent of the facets on a precious gem.” Indeed it is a classy, good-looking bowrider loaded with practicality and amenities. To illustrate, not only does the 224FS have a large, molded, integrated swim platform with built-in storage/cooler compartments, but also, mounted below this and just above the water line, an even larger extended platform with an integrated stainless steel folding swim ladder. Between the two of these platforms and the huge designer sun lounge, three roomy levels of watersports fun and relaxing are right at your fingertips for instant enjoyment. Remove the starboard lounge cushion for easy access to the cockpit and you are greeted with another designer-look interior with a full-width curvaceous and contoured rear lounge seat which curves gracefully around and slightly forward on both sides. Finished storage is found under all cushions. The cockpit liner is non-skid fibreglass with drainage and contains a centre-floor ski/wakeboard locker with a rubber mat to keep contents dry and to prevent scratches and it has a gas strut-assisted hinged cover which you can lock to protect the valuables within. Two more coolers are provided in the cockpit, bringing the total on board to three; one molded-in and the other a 25-quart portable. Storage within the side coamings are handy for all the small items you always want close at hand. The passenger console has a lockable glove box. Supportive and classy looking swivel, adjustable buckets seats with flip-up bolsters cater to the driver and passenger, while up front, through a generously wide walk-thru, are lounge seating with large padded backrests, more storage below all cushions, and a forward anchor locker. This locker can optionally hold a stainless steel retracting bow ladder. Bow filler cushions are available and dedicated storage for them is conveniently provided under the rear sun lounge. The helm continues the graceful, classy look with its effectively large eyebrow shielding sun and reflections from the standard fog-resistant gauges with low glare night lighting. Tilt steering with a sporty wheel is standard, as is an AM/FM/CD stereo with four speakers and MP3 adapter. Several stereo upgrades are offered which can include iPOD and Serius Satellite compatibility as well as dash and transom remote controls. Even though a stainless steel ski tow is provided, you may wish to add a wakeboard tower to your 224FS if your watersports activities are more than just casual. A bimini top with embroidered boot is standard but most will opt for a full enclosure. Six choices of hull colour are offered and the “Extreme Graphics” options may well suit purchasers of the wakeboard tower option. A full range of fourteen MerCruiser and Volvo Penta sterndrive power choices are available for the 224FS ranging from 190 to 300 horsepower. Base power is the 190 hp carbureted MerCruiser 4.3L V-6 with Alpha outdrive. Most buyers will likely move up to mid-range power from either manufacturer and likely choose the DP Duo-Prop from Volvo or the Bravo III dual prop set-up from MerCruiser. 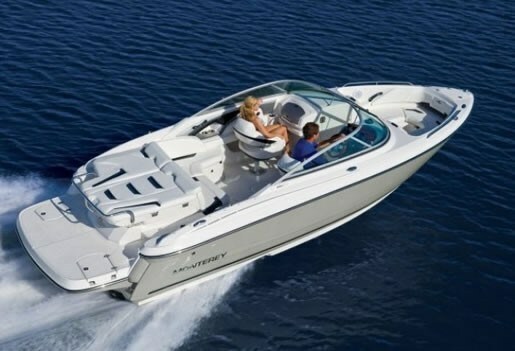 Whatever your power selection and however you choose to outfit your boat, this Monterey 224FS is an excellent choice as an all-round family fun boat.